An extended three bedroom semi detached property set within a well regarded location. Aldridge has the benefit of all main shopping facilities including a Morrison superstore in the centre of the village and is splendidly served with a range of good schools including Aldridge School, St Francis of Assisi Catholic Technology College and the highly regarded Queen Mary’s Grammar school for boys and High school for girls available at Walsall. The accommodation comprises a useful covered side entry, hallway, through lounge/dining room, extended fitted breakfast kitchen, contemporary family bathroom with separate w.c, double glazing and gas fired central heating. To the outside is a driveway which leads to garage and the rear garden boasts delightful views to the rear. Viewing essential. An internal inspection is essential to fully appreciate this three bedroom extended semi detached property situated in a popular location close to Aldridge Village Centre. Aldridge has the benefit of all main shopping facilities including a Morrison superstore in the centre of the village and is splendidly served with a range of good schools including Aldridge school, Saint Francis of Assisi catholic technology college and the highly regarded Queen Mary‘s grammar School for boys and high School for girls available also. Recreational facilities are provided at the Stick and Wicket Club at the green with cricket, running, football and hockey also Aldridge sailing club can be found at the junction of Stubbers Green Lane and Barnes Lane. The Splendid druids Heath Golf club is located off Stonnall Road. The property has gas fired central heating and double glazing and in greater detail comprises. 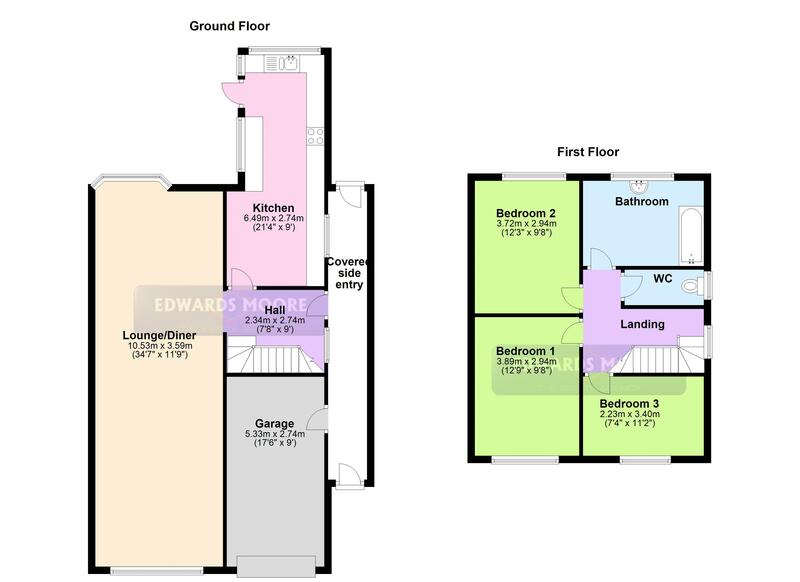 Having PVC double glazed door giving access to hallway, stairs leading off to first-floor landing, radiator, ceiling light point and sliding door giving access to. Having a double glazed leaded window to fore, radiator, two ceiling light points, three radiators, double glazed bay window to rear, feature fireplace with gas fire leading to. Having a range of wall and base cupboards, one and half bowl sink unit with single drainer, mixer tap over, gas hob, oven, integrated fridge/freezer, double glazed window to rear, double glazed window to side, radiator and door leading to rear garden. Having a double glazed window to side elevation, ceiling light point and doors leading to. Having a double window to fore, radiator and a range of fitted wardrobes. Having a double glazed window to rear, radiator, ceiling light point and fitted wardrobes. Having a double glazed window to fore, radiator, ceiling light point and access to loft. Having a bath, wash hand basin, low flush w.c, wall units, radiator, shower screen, shower and double glazed window to rear. Having a low flush w.c and double glazed window to side elevation. 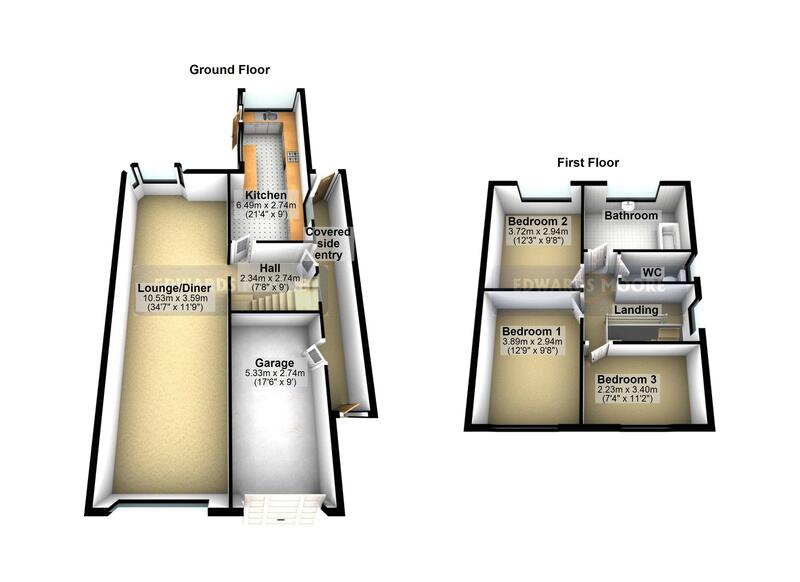 The property is approached via a driveway with access to garage and useful covered side entry. Having up and over door and shelving. Having a paved patio area, lawn, boundary fencing and delightful views to rear.